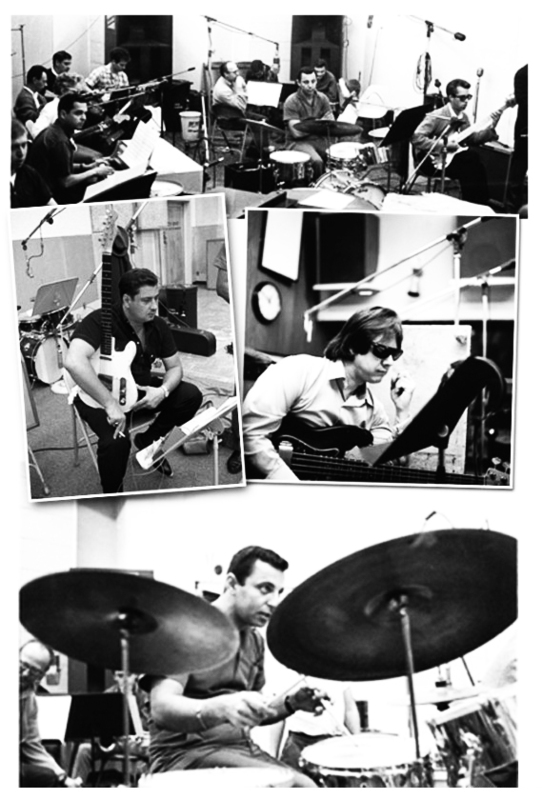 Today, nearly 60 years later, music fans are finally getting a chance to uncover the story of this incredible group of unsung session musicians in director Denny Tedesco’s acclaimed documentary “The Wrecking Crew.” Finally coming off the festival circuit, the KickStarter-funded film is making its world theatrical premiere in Toronto on February 20th at the Bloor Hot Docs Cinema. The doc, which took Tedesco nearly 20 years to complete, is a moving personal tribute to his father, the late great Wrecking Crew guitarist Tommy Tedesco, as well as to the music and the raucous times for which it was created. Tedesco introduces audiences to the real musicians behind pop classics like “Be My Baby,” “California Girls,” “Mrs. Robinson,” “You’ve Lost That Lovin’ Feelin’,” “Viva Las Vegas,” “Mr. Tambourine Man,” and countless others (you can listen to a selection below) and lets the surviving members tell their unbelievable tale in their own words. Coalescing in the heart of Hollywood during the late 1950s and early 1960s, the Wrecking Crew eventually came to include a revolving cast of close to 30-odd session players. But its core was musicians like legendary drummer Hal Blaine, guitarists Glen Campbell (who later found solo fame) and Tommy Tedesco, bass players Ray Pohlman, Lyle Ritz, and Jimmy Bond, and keyboardist Leon Russell. Together the group rose to prominence within the L.A. recording community, working on thousands of hit songs across multiple genres for radio, television, and film. But it was as early champions of rock and roll that they really hit their stride. By the mid-’60s, word had spread about a hot new sound that was burgeoning on the sunny West Coast and as far as studio players went, The Wrecking Crew were the band in town. For years, pop music had been produced within the walls of New York City’s famed Brill Building on Broadway Avenue, but as songs like Jan and Dean’s “Surf City” and The Beach Boys “Surfin’ U.S.A.” hit the airwaves, it wasn’t long before musicians began making the mass exodus to the Golden State. At the height of their careers, it wasn’t uncommon for The Wrecking Crew to work 15-hour days, recording hit records in the morning, radio ads through lunch, television spots in the afternoon, and performing backup for various touring acts before going to bed. Before the decade was out, they had clocked well over 10,000 hours in the studio and worked on hundreds of hit singles, including 38 chart-toppers, nearly doubling the Beatles. At one point, the Grammy Award for Record of The Year was awarded to a song performed by The Wrecking Crew seven years in a row. Their dedication, flair and musicianship made the West Coast sound of the 1960s a dominant cultural force while their camaraderie and sheer love for playing, injected the songs with soul and ultimately brought them to life. Continue reading via The Huffington Post.